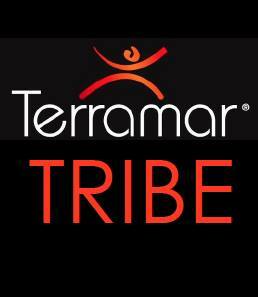 Have you ever hiked and explored your favorite trail or beach in the off-season? Places sometimes inaccessible, or located at the end of a seasonal road? Well, that is exactly what we set out to do last winter. 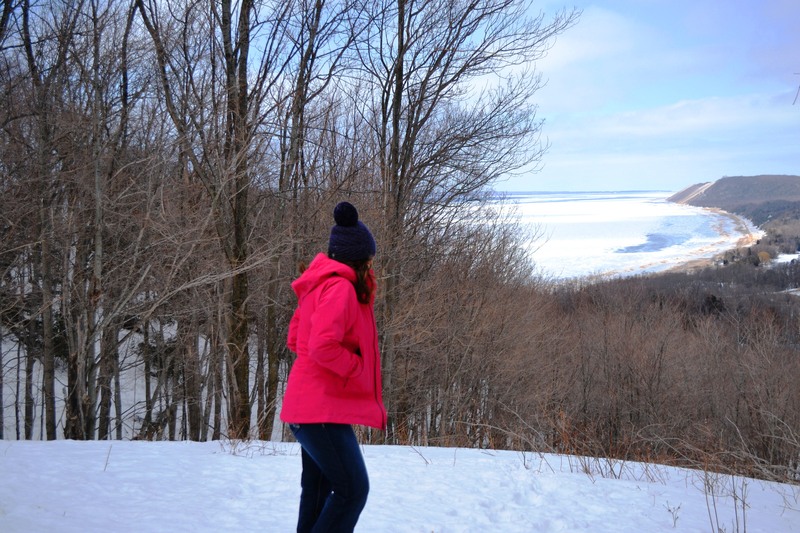 We challenged ourselves to get outdoors as much as possible, exploring our favorite hiking trails, and to find and embrace winter in Northern Michigan. To recapture the love we once had for winter as a child. Yes, even as an adult! Born and raised in Northern Michigan, both my husband and I spent many days outdoors as kids. The winter was no exception. 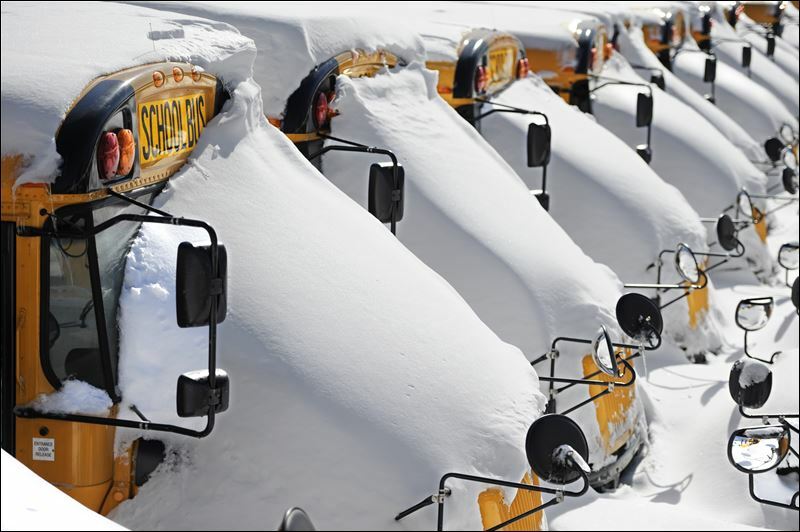 We actually enjoyed the cold long winters as it meant “SNOW DAYS!”, extra days off from school to play outdoors with family and friends. Of course that all changed once we grew up and had the responsibilities of driving to work, clearing the snow from our cars, the driveways, and even the roofs of our home! Getting outdoors and embracing winter was sometimes a challenge and breath-taking, in more ways than one. We made a pact to get outdoors, to explore all of our favorite places for the love of winter, and the health of it, no matter how cold it got. Believe me, some days, it got pretty cold! One particular morning we woke up to temps in the negatives. The sun was out and the sky was blue but the temperature continued to hover around a breathtaking, chilly negative 15 degrees. (Yep, another Polar Vortex was upon us). The extreme cold didn’t stop us though. We packed up our gear and our yellow lab Bear and headed out to our favorite hiking trail along the Sleeping Bear Dunes National Lakeshore at the Empire Bluff Trail. We had never hiked it in the winter before. We were excited to see it wrapped in winter white. So off we went! We arrived to the trail head parking area after taking the long way around the closed, seasonal road which was the normal entrance to the area. Once parked, we bundled up, strapped on our snowshoes, leashed up the pup and headed out onto the trail. The trail was barely traveled, rather deep in places since there were so few visitors in this off season. We trekked on for some time until we came to a clearing in the woods. There we stood and rested a bit, the bench seat unavailable as it was completely buried in the snow. The window of a view through the leafless trees offered us a small peek at the beauty that was to come later on down the trail. The majestic Sleeping Bear Dunes in the distance. We continued on down the trail towards the lakeshore, where we came upon a warning sign. 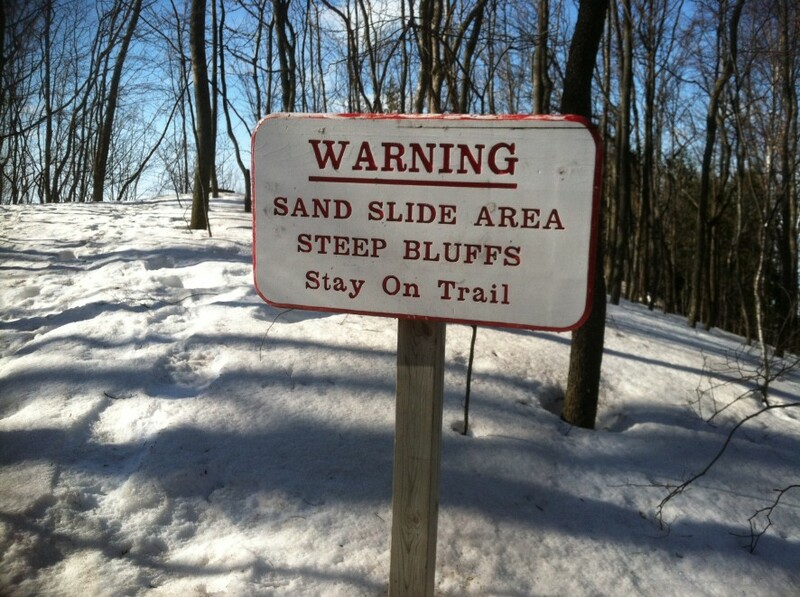 “WARNING SAND SLIDE AREA. STEEP BLUFFS. Stay on Trail”. From there the trail opened up from the woods leading out along a wooden board walk along the high bluffs overlooking Lake Michigan. The high winds of the winter had whipped up the snow, ice and sand drifting it across the boardwalk, nearly covering it completely in areas. In some areas of the boardwalk the snow was as high as the hand rails. 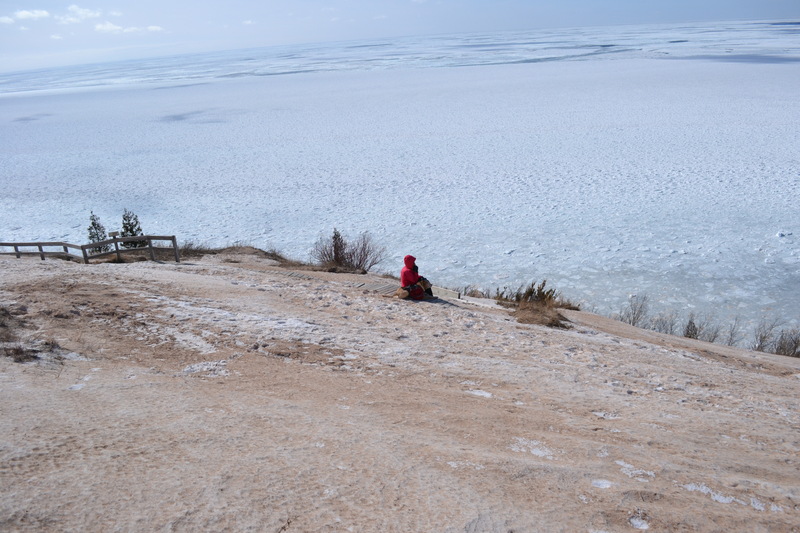 We trekked on cautiously along the bluffs not wanting to slip down the steep slopes to the ice-covered beaches below. We were grateful, with each step, for the extra traction and grip of the crampons on the bottom of our snowshoes. 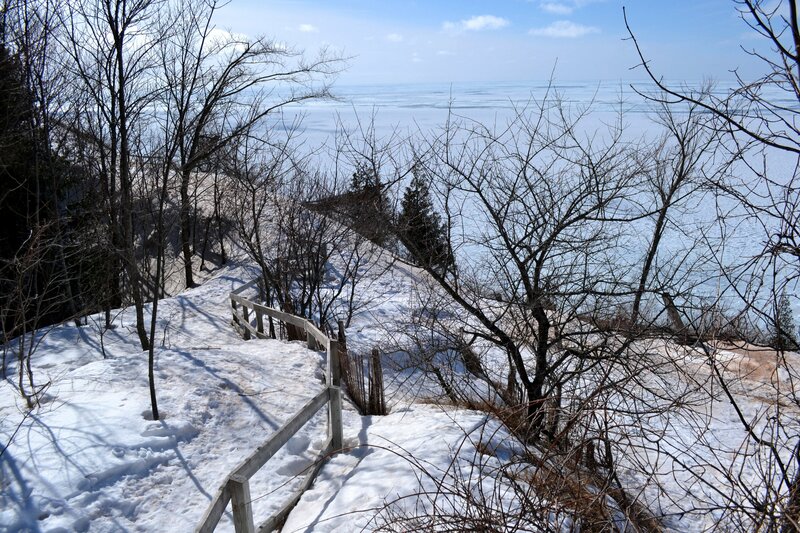 At the end of the boardwalk, there we stood, overlooking the completely frozen tundra of our beautiful Lake Michigan. It was amazing and breathtaking in its beauty as well as the bitter cold that confronted us high on top of the bluff. The winter winds blew the icy cold across our faces causing us to zip up our hoods and to shrink down into our jackets. But still, we lingered longer and took in all that was around us. Looking around we realized that many had never seen this spectacular view at this particular time of year. Most only in the warm summer or early Fall. We felt a sense of accomplishment and reward in that we knew that this was something very special. Mother Nature in her winter glory. Most would never experience it. It was an experience that we would never forget. Even our yellow lab Bear seemed to realize that this was something to sit down and enjoy as he laid down on the small portion of boardwalk that remained uncovered. I sat down next to him and enjoyed the moment. If you have never explored your favorite trails in the winter, I really recommend it. Don’t let the cold, winter snows keep you from getting outdoors. Instead of sitting indoors waiting for the winter to end, try doing something different this year. I challenge you to get outdoors, explore, and embrace the winter. 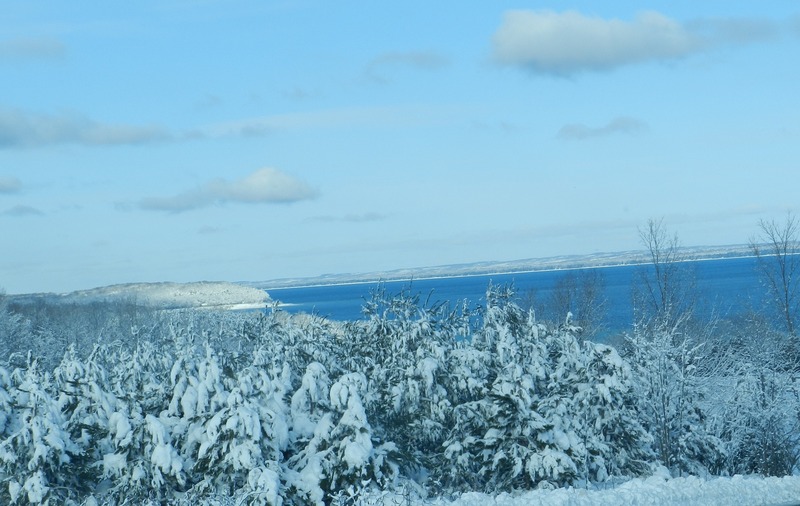 There are many great skiing and snowshoeing trails in Northern Michigan. 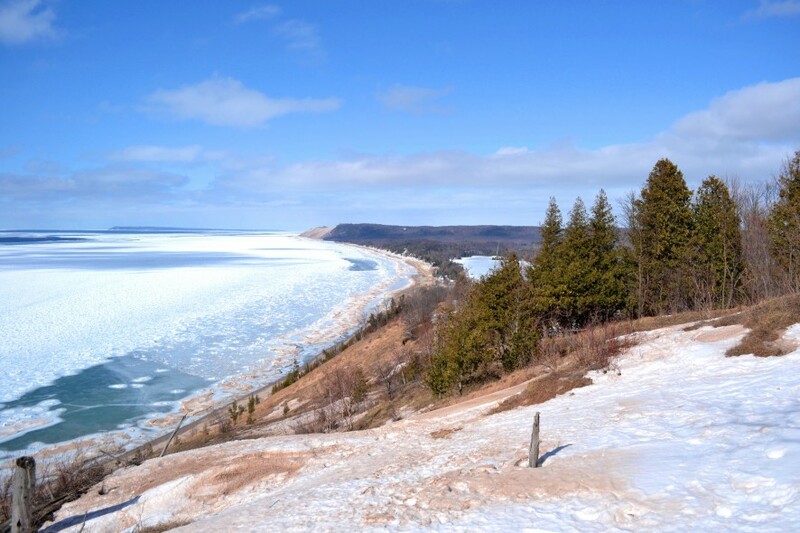 There are even guided Snowshoe hikes with a National Park Ranger at the Sleeping Bear Dunes. 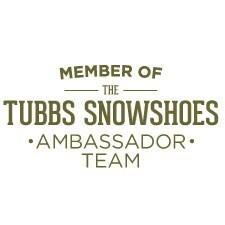 If you don’t own Snowshoes, borrow or rent a pair and just get out there! You may be really surprised with what you find, and how much you enjoy it. Let’s GET OUTDOORS and have some great adventures, share in the experience of embracing winter together this year!